MTN Cameroon and the Small and Medium Enterprises Promotion Agency, APME, November 11, signed a partnership agreement to enhance Cameroon’s digital economy. 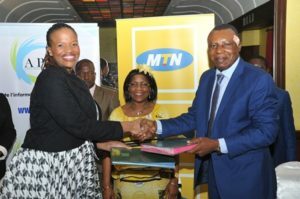 The agreement, which was co-signed by the Chief Executive Officer of MTN Cameroon, Philisiwe Sibiya, and the General Manager of APME, Jean Marie Badga, has been placed under the patronage of the Minister of Small and Medium Enterprises, Social Economy and Handicrafts (MINPMEESSA). Within the framework of this partnership, MTN Cameroon will provide small and medium enterprises in Cameroon with the support they need to reinforce their productivity and performance. Basically, the MTN Foundation will put at the disposal of the SMEs concerned, the best training possible to ameliorate their daily management, while MTN will provide a specially designed innovative business pack that addresses the needs of the 20,000 companies created through the Enterprise Creation Procedures Centre dealing with the APME. Going by the deal, MTN Cameroon will also set up an MTN Business Desk within all the 10 Enterprise Creation Procedures Centres of the Agency to provide hands-on support to Cameroon’s budding entrepreneurs. The new partnership will equally provide SMEs with all the technology tools necessary for their smooth functioning in terms of communication, connectivity and collaboration. The Chief Executive Officer of MTN Cameroon, Philisiwe Sibiya, said: “MTN Cameroon’s objective is to enable all participating SMEs to become leaders in their respective sectors. Going by the MTN Cameroon boss, the private-public partnership asserts MTN’s leading role, while providing the necessary innovation needed in the creation and support of SMEs, which she says is the cornerstone of a dynamic economy. Hear her; “The Government and the people of Cameroon can rely on MTN to adapt to these changing times. We are ready to contribute decisively to the aligning of Cameroon with the new digital world, the world of tomorrow,” Sibiya maintained. Meanwhile, the General Manager of APME, Jean Marie Badga, asserted: “That the partnership is an opportunity to illustrate APME’s capacity in supporting Cameroonian SMEs. “The Small and Medium Enterprises Promotion Agency will finance access by enterprises to these resolutions to the tune of 50 percent. This in a bid to valorise this productive partnership which will propel Cameroon’s development,” Badga declared. MTN Cameroon is a subsidiary of the MTN Group represented in 22 countries. Present in Cameroon since February 2000, the telecommunications company is one of the five most significant companies in Cameroon and second tax payer in 2015.